Somedays, I just want to scream when things that did work, no longer work. This happened this week when I needed to contact a vendor by email. This is usually a simple task where you click an email link and it opens in your default application. Instead of getting Gmail to open up in Chrome, I was staring at the Microsoft Store email app. Somehow, someway, my email app got reset. What broke is something called the mailto protocol. This is the protocol you see when you hover over a support, contact or some other email hyperlink. You’ll see something like mailto: and an email address. Protocol handlers allow us to do things like clicking an email address on a web page and having our web browser open our desired email application. It’s a nice convenience. I started with my Windows Settings and made changes to my email application and set new preferences. That didn’t work which meant I had to find another fix. Actually, it was a progression of fixes so I’ve included them in order. However, you can hop to any of them. This is a good starting point especially if you don’t recall ever having your email links open in Gmail. Open Gmail in one of the tabs. Look at the right-side of the address bar for the Protocol Handler icon. ￼It looks like 2 intersecting diamonds if you squint. 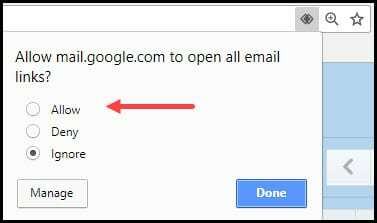 You should get a small dialog box that asks you to Allow mail.google.com to open all email links?. Choose the Allow radio button. Yes, this happened to me. All the suggestions I read said I should see that funky protocol icon in my address bar. Well, I didn’t. Check to see if the Do not allow any site to handle protocols slider is turned off. If the slider is off, slide the toggle to the right. 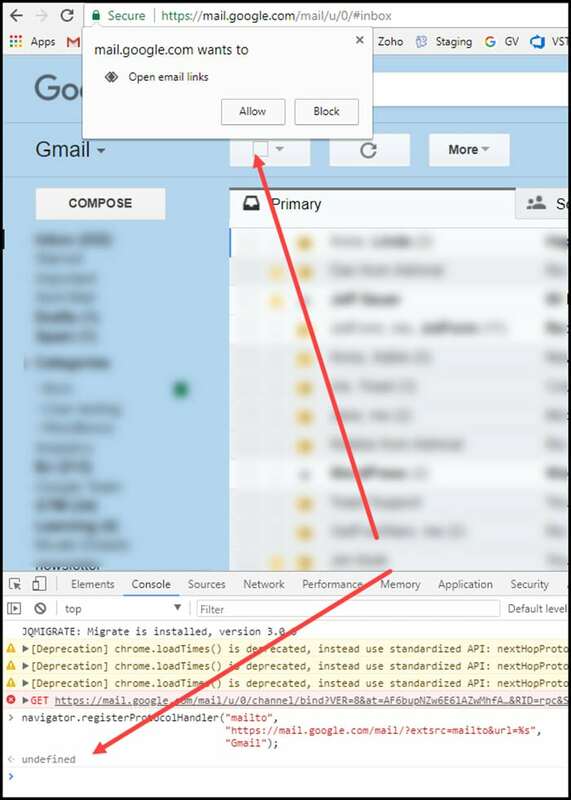 If you go back to your Gmail tab, you should see the protocol handler icon. Click the protocol handler icon. Select the Allow radio button. If you’re still with me, you’ve probably guessed solutions 1 & 2 didn’t work for me. However, I found a solution from Paul Irish on the Google Developers site. This is a bit geeky, but nothing like changing your Windows Registry. It does require you to open up Google Chrome Dev Tools. These tools are built into the browser. The Developer Console should open either at the right of your screen or the bottom. Chances are your screen will look a bit different than mine. Don’t worry about the warnings. Look for the > sign at the bottom. Paste this code right after the > sign. Yes, believe it or not, Solution 3 only got me part way. After testing the email link, it still didn’t work. I was staring at the Windows mail app….again. Sometimes you just need to delete and try again. From your Gmail tab, type chrome://settings/handlers in the address bar. Click the 3 vertical dots to the right of mail.google.com. Flip the Allow sites to ask to become default handlers switch Off and then back On. You should now see the protocol icon in the address bar. Hopefully, one of these solutions worked for you. If it didn’t, you might try searching for a Chrome extension that provides this functionality. I’m not a fan of adding extensions as each one takes memory. Learn productivity strategies and easy-to-use tricks to help you get through your everyday tasks faster and more efficiently. Unlock the hidden potential of Gmail and learn how to be more productive with this email system.